With these online self-study courses, you pick the date, time and location to learn. Now that’s convenience! Once you register for the course, you immediately receive a link to the course where you can access it again and again as your schedule permits. Each course in SBE University is an electronic book that typically includes 8-14 chapters. At the end of most chapters are quizzes, as well as a final exam at the end, all to help you confirm your knowledge of the material. One great thing about this Internet-based program is that it keeps track of where you have been in course, including noting the last chapter you viewed. In addition, the program keeps track of the chapters you completed, even if you skipped around. "The author uses lots of industry standards and relates them very well to the broadcast industry. This is a thought provoking course that guides the project engineer to new methods of managing the unmanageable task of today’s broadcast IT-centric projects." This course addresses the challenges of a contemporary technologist who works in the broadcast or media industry and offers techniques to ease the transition from broadcast engineer to media systems engineer. Each chapter provides practical suggestions and solutions for the digital era. Subjects include an introduction to media systems engineering, the role of the media systems engineer, the importance of professional societies and standards bodies, project management techniques, the planning process, process improvement, organizational efficiency and more. The FCC now permits moment method computer modeling of many AM directional arrays as an alternative to traditional cut-and-try adjustments and field strength measurements as a means of performance verification (“proof”). This alternative has the potential in many cases of saving a tremendous amount of time and expense, allowing the licensee of an AM station using a directional antenna to tune up and proof the antenna system for a fixed and greatly reduced cost. It should be noted that this is not an omnibus method moment modeling training course. 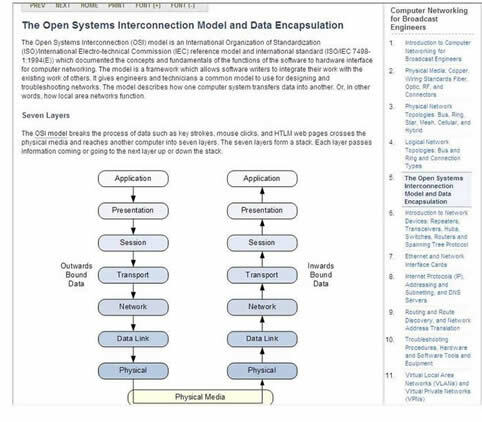 It does assume a basic understanding of modeling techniques and procedures. This course takes the student through every facet of AM antenna systems in all their forms, dealing with each element or variation separately and pulling the elements together to show how they are used in concert. This course, intended for the intermediate-to-experienced broadcast engineer, takes a practical, real-world approach to audio processing. Topics include loudness and the human ear, gain control, limiting and clipping, adjusting a wideband processor for voice and multi-band processing. The purpose of this course is to give the student an introduction to the fundamental concepts of computer networking. This course will assist the broadcaster in passing the SBE Certified Broadcast Networking Technologist exam. This course will provide an understanding of all the technical considerations that need to be taken into account in a file based architecture, as well as the changing roles and responsibilities engineers will have in designing and maintaining these new systems. The changes in workflow and business processes are also reviewed, as well as the new jobs / roles that are necessary in handling media in this architecture. This course will help the student understand the proper design, installation and maintenance of an FM transmission system and how its components and variables related to those components impact the performance of an FM station. The purpose of this course is to give the television engineer a solid grounding in the various aspects of video and audio for television, and to serve as a ready reference to the pertinent standards. This course provides an overview of video and audio for television, from the dawn of analog television broadcasting to today’s digital television transmission. The purpose of the SBE 8-VSB course is to give the student an overview of the 8-VSB system from end to end, providing all the basic information he or she will need to understand the nature of 8-VSB modulation and to recognize deficiencies in the transmitted signal. This information will be invaluable in installing, maintaining and operating a digital television transmitter facility. This course is intended to provide the broadcast engineer with some of the perspectives and responsibilities of financial management. Through topics covering basic business operational structures and financial management, it will be obvious that even not-for-profit broadcast operations must have cash flow and engineers play a large part in making that happen. Reasonable job expectations and the definition of what an engineer is and is not can help minimize frustration and unsafe work environments. Time management and working with the next generation of engineers will be helpful in reducing job stress and burnout. This course had no technical requirements and is designed for all who wear the broadcast engineer title. The purpose of this course is to give students an introduction and overview of the Simple Network Management Protocol, or SNMP. With IP networking becoming an ever-increasing part of a broadcast engineer’s environment, there is an opportunity to take advantage of this legacy IT protocol for our benefit. SNMP is a way to monitor data points and control different functions in remote equipment, using an existing IP network. Much of the latest generation broadcast equipment supports this protocol, and facility control devices are appearing on the market that can incorporate data and control functions obtained via SNMP alongside information and controls that use traditional hardwired inputs and outputs. The course provides the student with a working understanding of how a signal gets from end to end, how to troubleshoot telco problems and how to properly interface broadcast equipment to the telco world. This course will benefit individuals in either television or radio station facilities. Questions about SBE educational opportunities? Contact the SBE office.